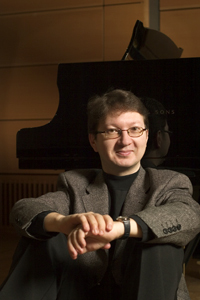 Kirmo Lintinen studied the piano under Dmitry Hintze from 1976–86; he studied jazz at the Sibelius Academy in Helsinki, from where he graduated in 1997. Lintinen began as a pianist with UMO Jazz Orchestra in 1989, and from 1994 onwards he has concentrated on conducting and repertoire planning. He has performed as a soloist, ensemble musician and conductor in Finnish jazz, symphonic, opera and chamber ensembles, including Avanti!, Tapiola Sinfonietta, the Ostrobothnian Chamber Orchestra, and the Finnish Radio Symphony Orchestra. In addition, he has worked as pianist, arranger and conductor with the successful vocal group How Many Sisters since 1994. Lintinen has composed well over a hundred compositions, ranging from small-scale chamber works to opera, from short pedagogical exercises to film scores, from dance music to dodecaphony, and from jazz to baroque music. He has been artistic director and planner for several Finnish music festivals. Lintinen received the Georgie Award from the Finnish Jazz Federation in 2003.